Click here for a downloadable PDF containing all historiated initials from the Fabrica. I’ve been a Fellow of the New York Academy of Medicine for over two decades, and over the years this organization has been a fountain of knowledge and learning for me. 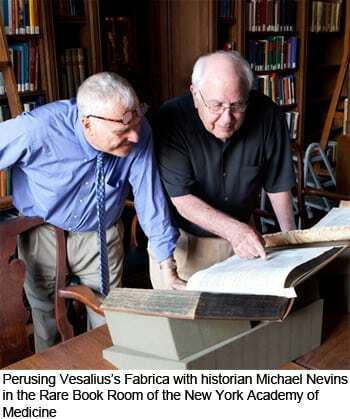 Recently I had the opportunity to do some payback by speaking at History Night on an aspect of Vesalius’s works that has received little attention by scholars since its publication in 1543. This past year was celebrated across the globe as the 500th birthday of Andeas Vesalius, the great 16th Century anatomist. Vesalius has been an inspiration to me in the way he combined art and medicine to create one of the greatest textbooks in medical history. 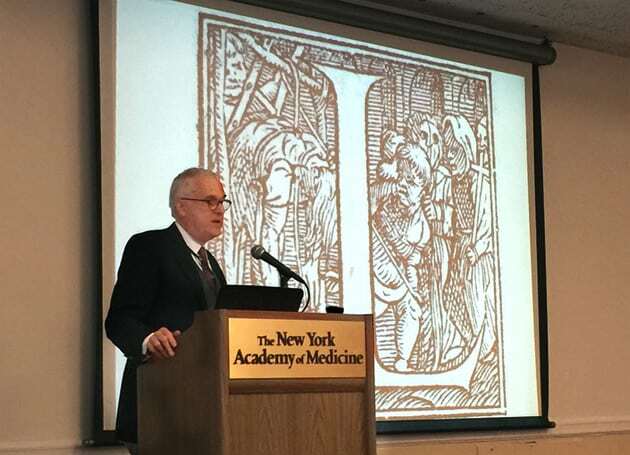 I had the opportunity and honor to work with historian Michael Nevins to speak at the Academy’s full day celebration of Vesalius last October, and my work on the historiated initials was an outgrowth of my collaboration with him. There are 40 unique historiated initials in the Fabrica, and they present a unique glimpse into the lives of doctors, anatomists, and medical students during the Renaissance. Surprisingly, they have received little attention from scholars with less than five English language articles about them in the 20th Century. Subject matter in the initials includes demonstration of physiology, treatment of patients, and preparation of human and animal specimens for dissection. Over the summer I was granted permission to peruse the original volumes in the Rare Book Room at the Academy, and make high quality photographs of the initials. I blew them up and studied them for months and found insights into not only the text but the life and times of Andreas Vesalius. At History Night I had the honor of sharing the podium with other presenters who spoke on other aspects of medical history. The medical profession is as old as human civilization and rich in stories of courage, innovation, and technology. As interesting as this is, medical history is rarely taught in medical school. It is my opinion that we can’t fully understand where we are without knowing where we have been, and this is one of the reasons that I spend my time in quiet rooms perusing dusty volumes. I truly feel that it has made me a better doctor. Get the schedule for the Fifth Annual History of Medicine Night here. Visit Dr. Michael Nevins’ website here. Images in this post and PDF are courtesy of the New York Academy of Medicine.